I just finished reading Rick Bogle’s book We All Operate the Same Way. I am awed by the incredible research he put into this definitive exposé of vivisection, not only at the University of Wisconsin-Madison but of vivisection in general. His initial descriptions of the experiments of Harry Harlow, arguably the most sadistic and brutal vivisector who ever lived—and who has a building named after him at the UW—are difficult to read but essential in understanding the complete lack of scientific credibility, empathy, humanity, honesty and legitimacy that defines the vivisector mindset. Because the non-profit PRISM People for Reason in Science and Medicine, of which I am co-director, is working to close down the Eunice Shriver Baby Primate Lab at the University of Washington, I was especially interested in the sections of the book that dealt with Eunice and Sargent Shriver’s involvement in setting up the Kennedy Foundation and the Eunice Shriver National Institute of Child Health and Human Development which were founded to promote the experiments of Harry Harlow and his cohort Harry Waisman. Bobby and Maria Shriver’s protestations that their mother knew nothing of what she was funding when she founded her institute are completely debunked in this book, as it is by Eunice’s own quotes in other publications. Both Shrivers were intensely involved in pushing for more experiments and attaining some sort of tangible results which, of course, were impossible to achieve since none of the experiments Harlow or Waisman perpetrated had anything to do with human babies. Eunice’s institute continues to fund the same kind of experiments at the Eunice Shriver Baby Primate Lab at the University of Washington. Throughout the book, Rick, with facts, figures and common sense, refutes vivisectors’ arguments that somehow their horrific experiments benefit humans. Rick leaves no doubt that the experiments do not. At the same time, he recounts, time after time, how the NIH, consisting mainly of vivisectors and benefiting mainly vivisectors, approves grants that cannot, even in someone’s wildest imagination, have anything to do with furthering human health. In the vivisectors’ relentless drive to attain more and more taxpayer grants, they are enabled in their efforts by newspapers and other media to convince the public that they do what they do to improve human health. The web of lies that Rick describes in the book is massive, woven as a protective shield over vivisection by the NIH, the USDA, politicians, the media, UW officials, elected officials and so many more. That animal activists obtain any victories at all over these mendacious monsters is a testament to the activists’ passion, intelligence, ingenuity and dedication. I will let you read the book to find out how all that turned out. My most heartfelt thanks I give to Rick, and to all of those groups and individuals who have fought to end vivisection at the University of Wisconsin and elsewhere and continue to fight to this day. As a psychologist who grew up on Harlow, I can only say that Bogle's work is a welcomed entry into the truth about what goes on in laboratories everywhere. As an undergraduate, for example, I learned about monkey (and other species) deprivation studies, a component of his target, as if they had high significance to my future in psychology. They did not. Since then, my own awareness and involvement in working on behalf of animals in labs have provided me with a day after day growing sobriety that has shaken off the nearly delusional myth called the critical importance of and benefits from animal use in research aimed at understanding, preventing and curing human physical and psychological disease. For those not interested in spending decades to unveil the truth behind government and privately funded animal research and the horrific life and death of the animals sacrificed, Bogle's work is that education in 606 pages of penetrating information. In fact, when we have advanced in our thinking enough to realize there needs to be science and ethics courses in the History of Animal Use and Why it Ended, Bogle's work will prove a quintessential textbook. Not an easy read, as the topic itself is oppressive and frustrating, but he puts it all in one easy to reach place. And truth is always worth reaching for. Author takes on UW animal research: Twenty years ago, when Rick Bogle was teaching middle-school math and science in rural Oregon state, a parent objected to his longstanding rule against killing “the small creatures who happened into my classroom,” including insects. The parent insisted on her daughter’s right to kill at will. That set off a year-long community-wide controversy, and got Bogle thinking more about how human beings treat animals. It was a journey that led him to cofound the Primate Freedom Project, a national group devoted to ending primate research. In 2003, Bogle moved to Madison, where he has been a prominent animal rights activist. For several years, he and his wife, Lynn Pauly, served as co-executive directors of the Madison-based Alliance for Animals. 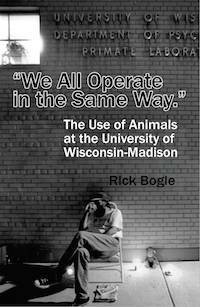 Now Bogle has written a 600-page tome on animal research at the UW-Madison, titled We All Operate in the Same Way. The self-published book came out in April; Bogle says it took him three years to write. The title is taken from a comment by a UW research official; it means to convey that the grounds for concern Bogle finds at the UW occur elsewhere. Having made his biases known, Bogle goes on to present a mostly scholarly investigation of UW research and its attendant controversies. He argues that the scientific benefits of animal research, including the work of UW primate researcher Harry Harlow, have been wildly overstated. Rick Bogle worked as a writer/researcher for several national animal rights organizations from 1999 to 2009, and then as co-Director of the Madison, Wisconsin-based Alliance for Animals from 2009-2013. He has spoken about animals’ rights and the use of animals in science at workshops, seminars and conferences for the past 20 years. Rick stopped eating animals in 1972, and has been an outspoken animal rights activist since 1997. While teaching at a rural middle school in eastern Oregon, Rick learned about the publicly-funded experiments being conducted on monkeys and chimpanzees across the county. What he learned altered the course of his life. In 1997, and again in 1999, he toured the country protesting at the labs and speaking about the ethical problems inherent in using animals as disposable tools for science. Coauthored with his wife Lynn Pauly, one of his books, Teaching Kindness, chronicles a controversy over insects and spiders that filled his last year of teaching.